With the PIXMA TS6120 Wireless Inkjet All-In-One printer, print all your photographs, documents, and even invitations quickly and easily. Designed for everyday use the TS6120 features built-in Wi-Fi, front and rear paper feeding and a 5-Color Individual Ink System - so you only need to replace the specific color that runs out. By using the brilliant Canon PRINT app, make copies quickly and scan important documents right to your smartphone. Further, the 5 Individual Ink Tank System ensures that your documents look sharp and your images look great on all of your prints. 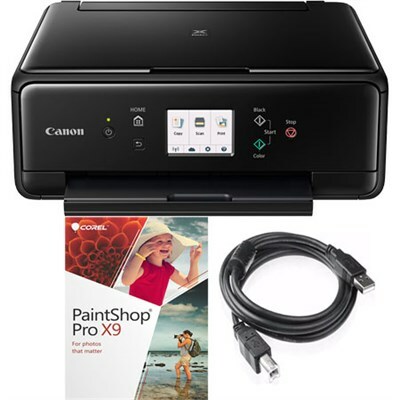 This brilliant printer from Canon makes it easier to connect to your smartphone, tablet and all your favorite devices. Enjoy hassle free print from the Cloud, Bluetooth, and social media or even on the go. Meet the PIXMA TS6120 Wireless Inkjet All-In-One home printer - built for all of your everyday printing needs. The PIXMA TS6120 Wireless Inkjet Multifunction home printer, is specially built for all your everyday printing needs!